Ten years is quite a long time between the two recording sessions. I wonder how that came about. Why also the two different venues? In any event, re-coupled at an attractive price from the original issues of 1 & 3 and 2 & 4 (see review) this two disc set makes great sense. Schumann symphony sets abound so what if anything marks this one out apart from the circumstances of recording? The declared use of 'period instruments' lends a noticeable delicacy and sometimes an edgy abrasion to the strings and brass. The horn 'choir' in the finale of the Third and Fourth have plenty of billowing upstart flavour and sovereignty. No question of being short-changed there. Several times I was left thinking about how much Berlioz was indebted to Schumann. There's no dearth of Schumann's hallmark upstart fury either. That said, it falls short of the overstated molten anger and impetuous rush of Boult in ancient though well restored sound from First Hand Records or of Muti on EMI Classics rather than the later readings on Newton. 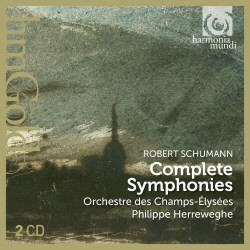 If you are looking for the Schumann symphonies with a fresh twist then look no further. My experience of this set was that I was hearing some passages for the first time and this from works for which I have a great affection and have heard on record many times. It's a good unfamiliar place to go when you are feeling jaded with your expectations of your own 'standards'. HM and Herreweghe and his orchestra open the door to a particularly fresh morning air. Have they wooed me away from Sawallisch, Barenboim, Vonk and Kubelik? No, but then there is room for two versions in any collection where funds permit. Presentationally the two discs are nothing less than splendid; typical of HM whose artwork is up there with the finest. There is a good and fluently translated essay by Hélène Cao. The notes are in French, English and German. The Harmonia Mundi sound is very clean indeed; just that finest bit more open in the case of the older Nantes sessions. All the symphonies have plenty of solar plexus impact. Excitement is never rationed.